While the PC announcements at CES 2012 have been dominated by Ultrabooks, there's no doubting that the humble desktop is also undergoing a mini revolution. Helped by widespread cooing over the 27-inch iMac in Apple Stores across the globe, the all-in-one PC seems to be undergoing a resurgence. 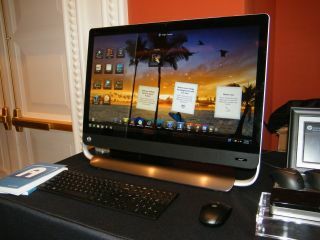 As well as the Samsung Series 9 all-in-one at this year's show, we spied this – a very classy looking effort from HP. It does, however, use a chassis that we've seen before. While others are opting for touchscreens ahead of the launch of Windows 8, HP eschew touch in favour of a traditional desktop experience boosted by high end features such as enhanced Beats Audio. The unit does, however, have the Magic Canvas desktop background that also ships comes with HP's TouchSmart PCs. However, the screen isn't as good as the iMac's – it does have a Full HD 1,920 x 1,080 display, but the iMac boasts 2,560 x 1,440-pixels. There's no doubt that, unfortunately, it shows. Various configurations will be available with Core i3, Core i5 and Core i7 variants available alongside either 4 or 8GB of memory, up to 2TB of storage and beefed-up graphics options from both AMD and Nvidia. You can also have an optional Blu-ray drive. Of course, all this comes at a cost, and the price won't be cheap. The HP Omni27 UK price starts at £999 and $1,200 in the US. The HP Omni27 UK release date is February.